In March of 2014, the District had nearly 3,700 businesses that began hiring employees for the first time in the previous 12 months. 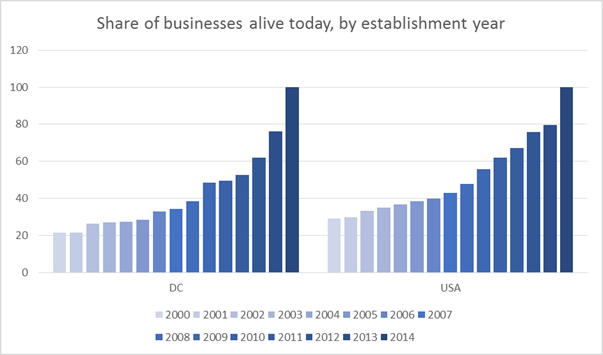 This is the highest number of such establishments since 2001, according to Bureau of Labor Statistics data, which track business births (and deaths) in the District. These new businesses collectively added 17,000 new jobs in the same year—that is 3.7 percent of all jobs in the District. On the down side, 2,661 businesses that hired employees in the year before stopped hiring—the businesses are either dying or moving elsewhere. This number is better (lower) than what we saw last year, but still pretty close to its five-year average. The closing businesses took away with them 13,193 jobs—this is about a third of all jobs lost in the District during the same period. In fact, new and closing businesses account for a third (and declining share) of the job churn. 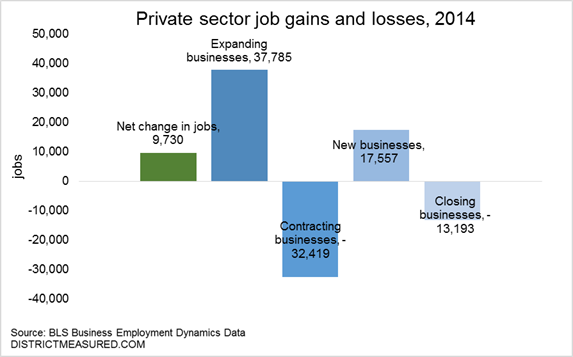 For a net increase of 9,730 private-sector jobs during the year, the District’s private sector added 55,342 new positions, nearly 37,800 coming from establishments that are expanding – or have a higher number of employees in March of 2014 compared to the March of 2013. The data suggest that over that single year, only one out of six jobs opened were net additions, the remainder made up for jobs that were lost somewhere else in the District. That is, 5 out of 6 positions or 82 percent of all job openings were just compensating for existing jobs. That is our churn rate. The churn rate turns out to be an interesting figure. First, to go through the mechanics of it, the higher the churn rate, the lower the net number of job increases. For example, when the city adds no new jobs, the churn rate is 100 percent. When the churn rate goes above 100 percent, it tells us that the city is losing jobs—like a game of musical chairs, when all opened positions are filled, some people who just lost their jobs still remain standing. 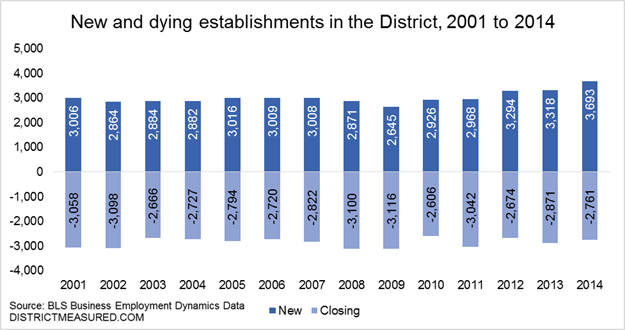 New and expanding establishments continue adding jobs, but they are not doing it as fast as the rate at which contracting and closing businesses are removing jobs from the District. We see such rates during the last two recessions (shaded gray in the graph below)—we also see that the District weathered both these recessions better than the nation in general. We lost net jobs, but not at such a high rate as the entire nation. In the nation, for ten jobs lost, only four new ones opened in the same year, and six were lost. We generally talk about the federal government expansion as the reason why the District’s total employment did not suffer very badly, but the churn data from the private sector shows us that the private establishments in the city handled the recession much better than the private establishments in the U.S. in general. So, how likely are the new businesses to survive in the District? It turns out that the odds of survival is lower in our city compared to the nation in general. In March of 2014, the District had 2,899 new businesses. This is the highest number of new establishments for a year since 2001, according to BLS data. These new businesses accounted for about 12 percent of all business establishments in the District. On the other side of the age spectrum were business that had been established before 1993: one-fifth of all private sector business establishments in the District first began operations 21 years ago! If previous trends hold true, the District will lose one quarter of these 2,899 new businesses by March of 2015. In fact, in about ten years, only 762 businesses established today will remain intact. 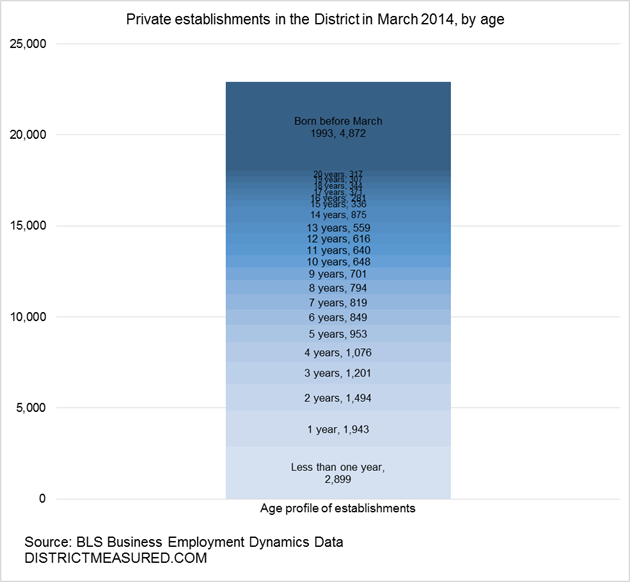 The odds of survival for private sector firms is much lower in the District compared to the nation in general. The first year survival rate (counting from 2014 backwards) is 76 percent in the District compared to 79 percent in the U.S. 48 percent of today’s new firms would still be standing in the District after their first five years of operation while the comparable metric for the US is 58 percent. What exactly is this data? The data are from the Business Employment Dynamics data compiled by the Bureau of Labor Statistics. New Businesses are businesses who had no employment in the previous quarter. Expanding establishments have positive employment in the March of every year with a net increase in employment over the year. Contracting establishments have positive employment in the March of every year, with a net decrease in employment over the year. < Previous Is Your Neighborhood Elementary School a Sure Bet? Next > Painting and Sculpture for Sale. Asking Price: $300 million. How can a handful of artworks be worth more than all the homes in Georgetown?